One of the most loved and recognisable chefs in Britain, Brian Turner has long been a presence on TV. He trained at Simpson’s in the Strand and also had time at Lausanne, Claridge’s, The Beau Rivage and The Savoy. It was back in 197 that Brian opened his own place, The Capital Hotel with Richard Shepherd, and before long the pair picked up a then rare Michelin star for their efforts. Another restaurant followed in the form of Turner’s in Walton Street, Chelsea, and the next 15 years saw it enjoy much success, leading Brian to open further eateries in Birmingham and Slough and in 2003 at The Millennium Hotel in Grosvenor Square, Mayfair. 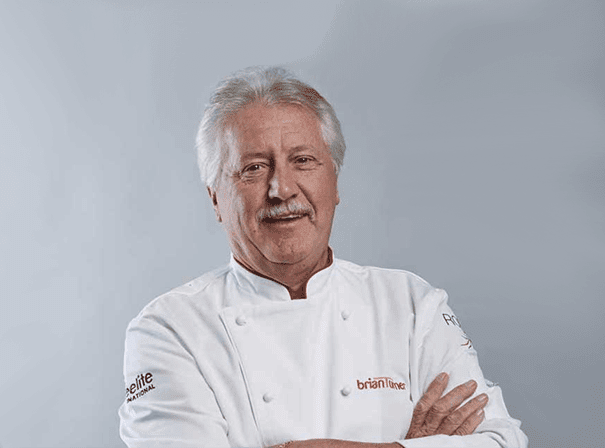 Nowadays, his remaining restaurant is at Butlins, and Brian himself is also President of the Royal Academy of Culinary Arts. Alongside cooking in restaurants, Brian has also made himself a successful and prominent TV celebrity chef who is never far from British screens. He was the first ever chef to appear in the hugely popular and long running BBC show Ready Steady Cook and spent 14 years with the show. As well as the she has been on the likes of This Morning, Daily Cooks Challenge, Saturday Kitchen and many others over the years. For his services to cooking, Brian was awarded a CBE in the 2002 birthday honours list and he has also been made an Honorary Professor of The University of West London, a Fellow of the City and Guilds of London Institute as well as receiving Honorary Doctorates of Science at Leeds Metropolitan and Sheffield Hallam Universities.